Wipe dried cuttlefish (squid) with a damp towel. Place on a metal grating over a baking tray and broil in the oven until fragrant. This takes about 4 to 5 minutes each side in a toaster oven. Remove and set aside. Fill a large pot half full of water. Bring to a boil. Add pork neck bones or ribs. Allow it to blanch for 4 to 5 minutes. Remove with thongs and rinse in cold water. 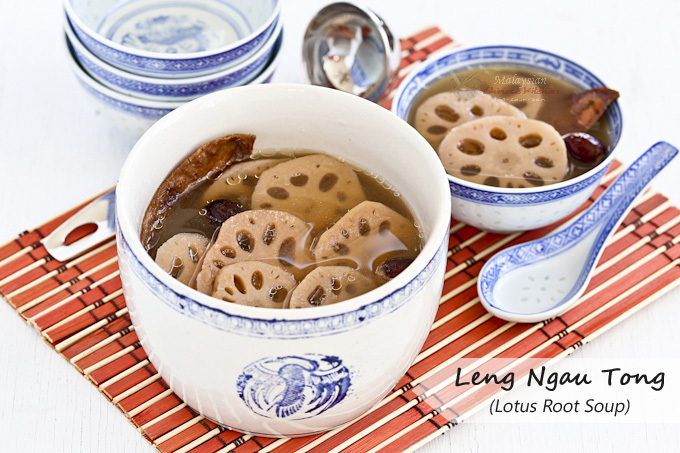 Add blanched neck bones (ribs), broiled cuttlefish, red dates, and lotus root. Bring water back up to a boil. Reduce heat to low and allow soup to simmer for 1½ to 2 hours. Skim off any scum appearing on the surface.